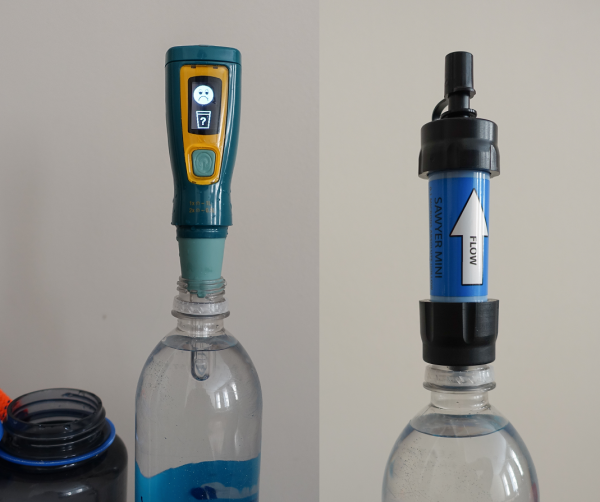 In the “Developing a System” post I discussed the potential impact your choice of bottle could have on things like your water purification method and how accessible your water is while you’re hiking. For years, the traditional choice was the trusty ol’ Nag bottle. In fact, the debate was never Nalgene vs. not-Nalgene, it was usually soft-sided (HDPE) Nalgene vs. Lexan Nalgene. While it’s definitely not the fad it used to be, there are still plenty of them on the trail. The question isn’t really why… most people have a pile of them in their closet (I’ve got them so I might as well use them), and REI has an entire display dedicated to them (that must be a good water bottle because it seems to be the standard). I honestly don’t know if it was a genuine need or simply marketing that propelled Nalgene to the top of the outdoor industry (they were originally used in labs), but they’re largely unnecessary today. Sure, they’re still functional, but there are alternatives that are definitely worth considering. 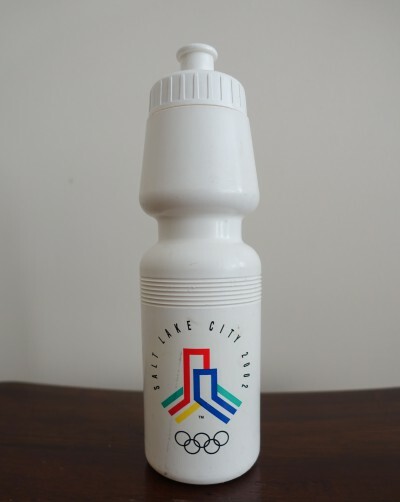 While there is a seemingly infinite variety of water bottles to be found in the world, there are 2 main types I’ll focus on here: “bladder” type bottles (made popular by brands like Camelbak and Platypus) and, simply put, disposable bottles. I do mention water treatment methods in this article, but my primary focus here is on the bottles. I’ll write more about treatment methods in the next post. While they’re extremely popular, Nalgene bottles are actually significantly heavier than alternatives. 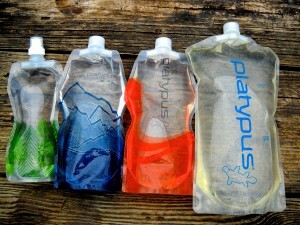 For the weight of one lexan Nalgene, you could carry seven 1L Platypus SoftBottles. I used Platypus SoftBottles exclusively for over a year, and that’s not including the years I spent using a 2.5L Platypus as a hydration pack (with a drinking tube and bite valve). The advantages are obvious: they weigh a fraction of what traditional water bottles weigh and they’re compact when empty. Weight-wise, you could carry 2 for every 1 disposable plastic bottle you got rid of, and 7 for every 1 Lexan Nalgene bottle… which means carrying a spare is far easier than with any other water bottle type. The initial concern is also obvious: are they durable enough to be reliable? I think, for the most part, the answer is yes. I’ve only had one failure in the field, which occurred when a 1L SoftBottle slipped out of my hand and landed on a rock downhill from where I was standing. Even then, the bottle itself didn’t fail: the cap exploded and water poured out. This brings up another potential concern: SoftBottles can be more difficult to grip than hard-sided containers. Now, with the exception of that one incident, I don’t think I’ve ever actually dropped one. But I have had moments, especially in cold weather and while wearing gloves, where they’ve been tricky to hold on to. Choosing a water bottle can impact the usability of your water purification system. Another (very minor) disadvantage is that the mouth is too small to use with a SteriPen. My workaround to this has been to take an old SoftBottle and cut the top off, creating an opening large enough for a SteriPen. I collect water in the cut-off SoftBottle, sterilize it, then pour it into my other SoftBottles. The process works fine for 1-2 people during breaks but is somewhat tedious for water-on-the-go. This disadvantage isn’t specific to SoftBottles though; most disposable bottles have the same size mouth. The SteriPen doesn’t fit into the smaller sized openings found on the Platypus SoftBottle and most soda bottles. The Sawyer Mini, on the other hand, fits the threads on most of these bottles. Disposable bottles may not seem like the first choice for inclusion on a list of reliable hiking gear, but there are many available today that are easily sturdy enough for hundreds of miles on the trail and they’re still significantly lighter than Nalgene bottles. I’ve noticed that, for some reason, SmartWater seems to be increasingly popular. It’s definitely the right choice if you’re looking for a tall, narrow bottle. I’ve read that they fit the Sawyer filters better than other bottles, but I’ve yet to do a side-by-side comparison since I mostly use a SteriPen. 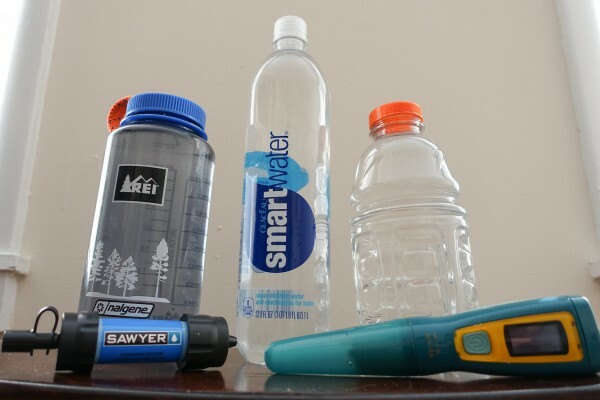 I have used the Sawyer Mini with a 1L SmartWater bottle and it worked fine. The main reason I started looking into disposable bottles was to regain the “hard-sided container” aspect. Filling a SoftBottle can be challenging at certain water sources because the pressure on the outside of the bottle, when submerged, causes the container to collapse. The challenge is that I need a hard-sided container that fits the SteriPen, because I can’t fill a bottle with untreated water and then dump it into another container to be sterilized, only to be dumped back into a bottle that is now “dirty”. Some people may consider this to be overly cautious, and I know there are some that don’t even treat water anymore… but my philosophy is this: if I’m going to treat it I need to consider that it’s all contaminated, not just some of it. Otherwise, there’s no sense in treating it at all. Another advantage to this method is that if the hard-sided bottle fits the SteriPen, I can eliminate the step where I need to fill another container first and then transfer the water to my drinking bottle. Note that this method doesn’t account for droplets on the inside wall of the container or the mouth so make sure the bottle is full when you treat it and wipe the mouth when you’re done. A Gatorade bottle (left picture, right bottle) has a wide enough mouth to comfortably fit the SteriPen. I’m a little cautious when it comes to the Powerade bottles (right picture, left bottle); I’m not confident the SteriPen is getting far enough into the container to treat all of the water. Even the Gatorade bottle is a little shallow; be sure to swish the water around to ensure circulation. To be honest, I’m still experimenting in this area. Currently I’ve settled on a hybrid: One Gatorade bottle for active use and a varying number of SoftBottles, depending on conditions. If water is abundant, I’ll pack the Gatorade bottle and a 1L SoftBottle; only filling the SoftBottle when I need to. For additional capacity, I’ll also pack a 2.5L bladder and use it when water is a concern. I’ve also found, at least on my pack, that while both types are easy enough to pull out of the side pocket, the hard-sided containers are easier to put back while I’m still wearing the pack. Once the SoftBottles start to drain, they can get a little floppy. A workaround is to blow a bit of air back into the bottle before you try to push it into its pocket. The hard-sided containers still win in this area, though. This bottle is lighter than a Nalgene and has a wide enough opening for a SteriPen, but only holds 24oz, which makes it inefficient since a SteriPen is calibrated to treat .5L or 1L. There are two items I haven’t discussed that I would like to briefly address: 1) Bike bottles, and 2) drinking tube/bladder combos for traditional “water bladder” setups. 1) Bike bottles are definitely a viable alternative to the 2 options mentioned above, but most hold a lower capacity and have a lower capacity-to-weight ratio. They do tend to have the advantage of a wider mouth, which is good news for SteriPen users… but SteriPen treats in 1L and .5L increments, which means wasted battery power on bottles that are 24oz. (pictured left). The wider mouth also makes it impossible to use with the Sawyer filters (note that this only applies if you’re planning on drinking straight from the filter). 2) I used a drinking tube/bladder combo for many years, and I still think there’s a case to be made for it: you don’t have to think as much about hydration when you have the convenience of a drinking tube. There were 3 reasons I ditched mine: weight, maintenance, and convenience. Regarding weight, the drinking tube/bite valve/bite valve cover doesn’t weigh THAT much, but when you think about it, it does weigh more than the bottle itself. You could ditch the bite valve cover to save some weight, but that leads me to issue #2, which is that they’re hard to keep clean when they’re semi-permanently attached to your pack. Any time you set your pack down, there’s a potential that the bite valve is going to land in the dirt. Since I’ve ditched the drinking tube, I’ve found that I spend a lot less time worrying about my pack falling over when I put it down. As far as the convenience aspect, I’m referring to the fact that bladders are typically stashed on the INSIDE of a pack, which makes them harder to access for a refill. One of my #1 goals now is to not have to open my pack during the day (between camps). This keeps my stops shorter and my days more efficient. Storing water on the outside of my pack is a must. I did try moving the bladder to the outside of the pack and running the drinking tube from there, but I found that the bottle would flop out of the pocket frequently once the water level dropped . At that point, since I could just reach over to the bottle, the drinking tube seemed superfluous. Also, while I haven’t discussed the pros and cons of using each of these bottles in freezing temperatures, drinking tubes are significantly harder to maintain in cold weather. All of this probably sounds extremely stringent for something as simple as a water bottle, but it’s not so much the water bottle as the system it becomes a part of. As far as water purification is concerned, there are methods that are less dependent on the bottle type, which I’ll discuss in the next post.